It should come as no surprise that millions of undocumented immigrants work in the United States. Until recently, some of them worked at two, perhaps more, of President Donald Trump’s properties. About a dozen undocumented immigrants worked at Trump’s golf clubs in Bedminster, New Jersey, and in Westchester County, New York, according to The New York Times and The Washington Post. The fact that undocumented immigrants were employed at the properties of a president who rose to the White House by criminalising and attacking these very people—whom he calls “illegals”— is worth noting, of course. But the practice of employing undocumented immigrants is much more common than we might imagine. There is no evidence that Trump himself knew undocumented immigrants were working at his clubs. However, two of these employees, both of whom worked at Trump’s Westchester club, told me in an interview that they had worked there for years and had never had any problems. Until they were fired. “The system is broken,” he concluded. The fact that many undocumented immigrants worked at Trump’s properties for years is not surprising. What is surprising is that we pretend that this is something unusual. There are undocumented employees throughout the US, and we all benefit from their labour; they harvest our food, build our houses and apartments and look after our children, taking on the jobs most of us reject. It is deeply hypocritical for Americans to badmouth undocumented immigrants, given the benefits they provide to society. It would be extremely difficult to find a single American whose life has not been positively affected by these immigrants. The United States, as everyone likes to say, is a nation of immigrants. Now, that national identity is under siege. 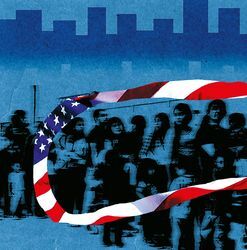 Many Americans are frightened by the country’s demographic revolution, and many would prefer that the country stop accepting so many immigrants, documented or undocumented, and instead become a nation of settlers and senior citizens. Trump and the other merciless critics attacking undocumented immigrants refuse to accept a simple fact: Every time they visit a restaurant, or stay in a hotel, they receive the services of one or more undocumented immigrants. Such is life in the United States. Ideally, the 10.7 million undocumented immigrants that now live in the United States would gain legal status. Unfortunately, in our current political climate, this is impossible. Until we have a new president, we can only operate in Trump-survival mode.